See media reporting on the opening of this exhibit at the National Museum of the USAF. 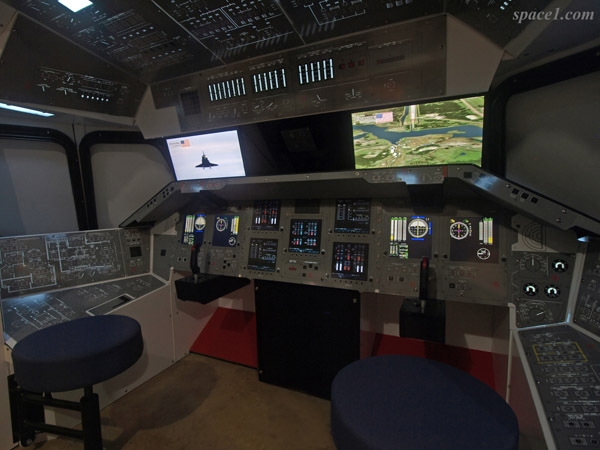 The Space Shuttle Landing Simulator combines a reproduction of the forward portion of the shuttle flight deck with exhilarating software that allows the visitor to pilot the shuttle to a successful landing. Two visitors at a time can fly separate simulations. 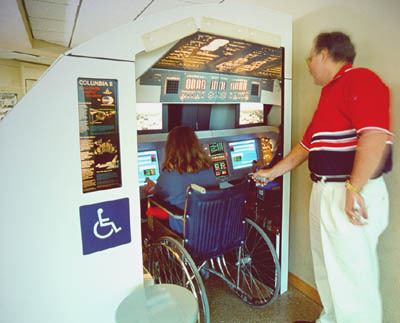 Rotating stools allow wheelchair access to the realistic cockpit. 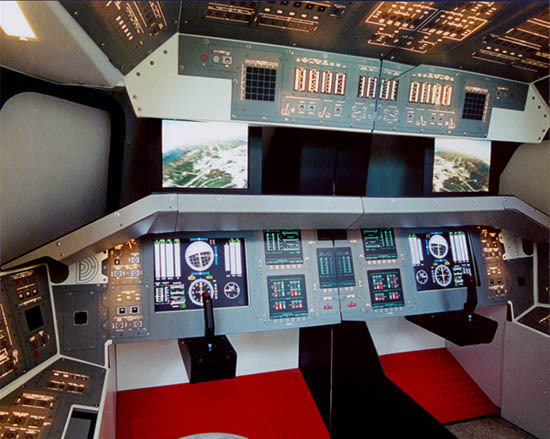 The Commander’s area in the Space Shuttle Landing Simulator. The monitor at top displays the forward window view. A single monitor in the console simulates the flight instruments, viewed as if on two separate monitors. (The two monitors at right are stationary graphic displays.) Panels are backlit, similar to the actual panels. Wheel chair accessible per ADA guidelines. Illuminated control panels with long-life LED lamps. Assembled dimensions: 146” wide x 75” tall x 72” deep. Dismantles to fit through a 36” wide doorway. Dual monitors (window view and control panel instruments view). Accurately reproduced inner window frames. Industrial grade stools rotate out for wheel chair access. 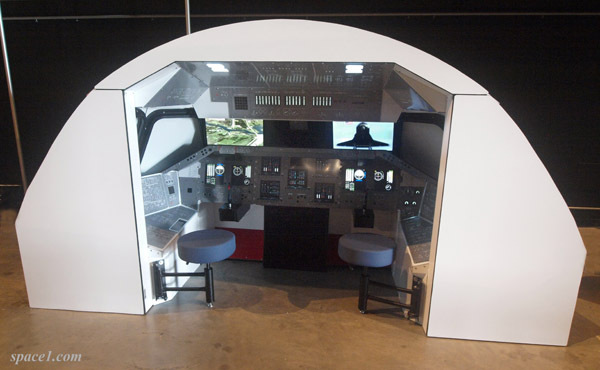 Our approach to exhibit design yields a simple cockpit with accurate dimensions, enhancing the experience. 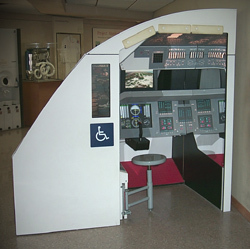 Your visitor sits in an accurate recreation of the shuttle flight deck. Aspiring astronauts undergo a brief flight instruction session, then guide the shuttle on its approach and landing at the 15,000 foot-long Shuttle Landing Facility runway at the Kennedy Space Center, or at Edwards Air Force Base in California. From training through landing the experience lasts about five minutes. 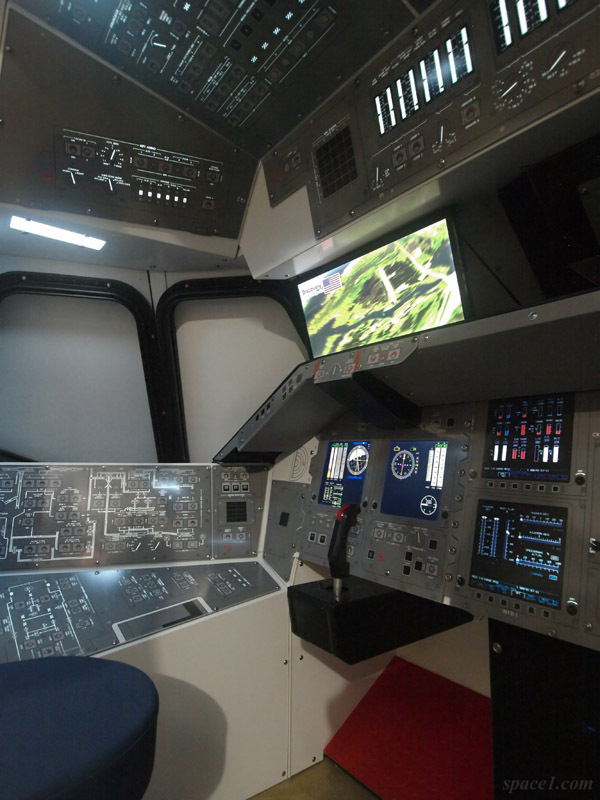 The simulator integrates the popular Discovery Final Approach software by Binary Star Ltd. The experience is brimming with the sights and sounds astronauts experience. On a cockpit window monitor, visitors see the rapidly approaching terrain as the shuttle gets closer and closer to touchdown. The voice of Mission Control feeds the “pilot” information based on actual flight conditions. After landing, the visitor receives a short feedback session from the computer describing their mission’s outcome. 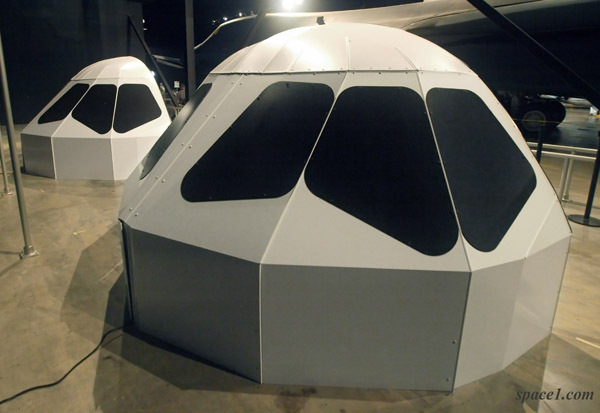 Space Shuttle Landing Simulators installed in the Cold War gallery of the National Museum of the United States Air Force. Later they will be moved to a new gallery together with the museum’s recently acquired Crew Compartment Trainer artifact. 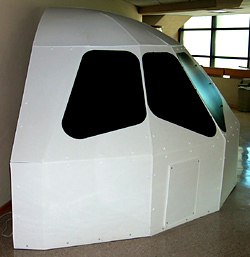 In addition to the full forward cockpit, a smaller version is available that reproduces the left half of the shuttle cockpit. An interior mirror gives the illusion of sitting in the full cockpit. (Shown with the earlier control panel monitor design.) This version is 78” wide instead of 146”. Dr. Douglas Rittman of El Paso, Texas and his daughter Susie Rittman enjoy the wheel chair accessibility of the single-seat Space Shuttle Landing Simulator at the New Mexico Museum of Space History in Alamogordo, New Mexico.